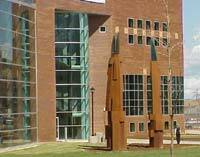 The sculpture outside the Physical Education Building was solicited from New Mexico artists, Howard and Kathleen Meehan. The Meehans feel that the key to physical success is the coming together of body, mind and spirit, and that this union is built upon focus. Effective focus is what brings about that human physical experience of being in that elusive euphoric zone of physical peakness. The Meehans feel that the sculpture celebrates this focus, as well as implementing a metaphor of the strength and power in the geological formations surrounding the campus. At the top of the three 30-foot forms are thick chunks of laminated prism which allow interaction between the sculpture and light. Howard, a triathlete himself, and wife Kathleen operate Firefly Studio in Santa Fe.